Tips on installing the stuffing box. 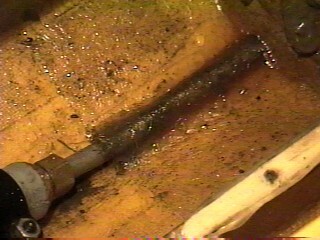 Here is a picture of the stuffing tube glassed in the bottom of a 46" Gator from Warehouse Hobbies. Here is a closer look inside. 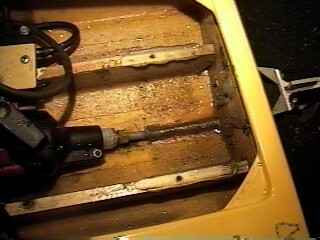 A hole is drilled right on the bottom of the hull and goes thru the transom. Then 3" by 6" glass cloth is glassed over the stuffing tube and holds the tube in the bottom of the hull. Also note that the tube is bent up to mount into the engine. 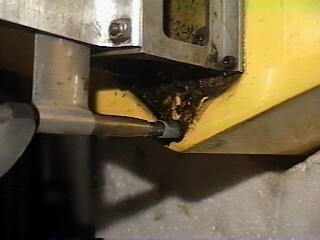 Here you can see the stand off is mounted after the tube is glassed in place. Note the stuffing tube is right on the bottom of the hull but looking from the back it looks to be off the bottom. 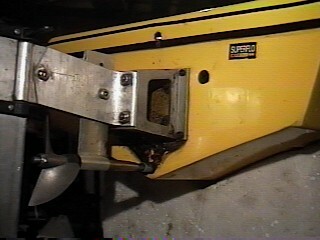 The hull can be over 1/4" thick at this location. Just be sure the stuffing tube is at the bottom of the hull. If you want more pictures or info on this just ask I will be happy to help you any way I can. Need more info on something Email special REQUEST to me HERE!